Paroda Bailey Fulton will be one of the former West Routt County residents featured during a cemetery tour Saturday in Hayden. 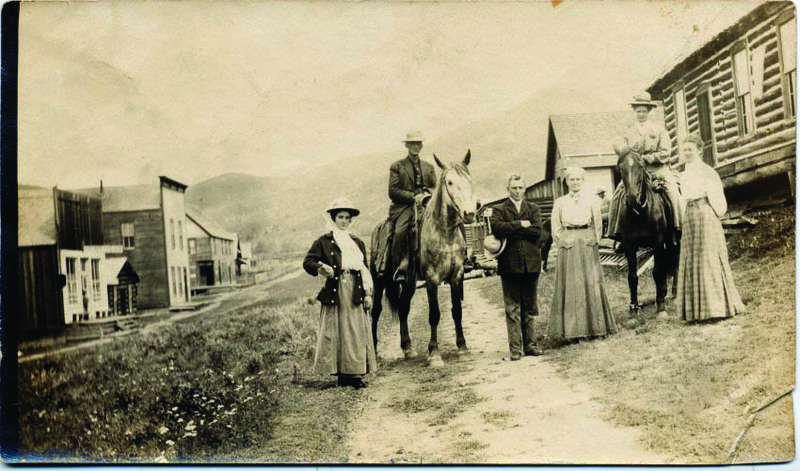 She is pictured on a horse with her wedding party and husband, Charles L. Fulton, at Hahn's Peak. A half-Indian cowboy who was killed in a shootout at a downtown saloon in the 1890's​. Teacher who was famously pictured with her husband on horseback at their wedding in Hahn's Peak. Town doctor who died tragically in a car accident while returning from an emergency call. Quarter horse breeder who was inducted into the American Quarter Horse Hall of Fame in 1986. Was killed in May 1914 by neighbor Jim Oldham after a school board meeting. A half-Indian cowboy who was killed in a shootout at a downtown saloon in the 1890’s​. Teacher who was famously pictured with her husband on horseback at their wedding in Hahn’s Peak. Steamboat Springs — The Hayden Cemetery will be alive with history Saturday when Hayden High School drama students tell the stories of seven people buried there. One student will play the character of Cliff Fulton, who was killed in May 1914 by neighbor Jim Oldham after a school board meeting. Another student will portray Paroda Fulton, a former teacher whose wedding was documented with a well-known photo of the couple on horses at Hahn’s Peak. “It’s living history,” Hayden Heritage Center Curator Laurel Watson said. The museum is teaming up with the Haven Assisted Living Facility to host a chili dinner followed by the Echoes of the Past Lantern Tour. Chili will be served from 4:30 to 6:30 p.m. Saturday at the Haven, and the cost is $5. Proceeds go to the Haven, and tickets can be purchased at the door. At 6:30 p.m., those going on the lantern tour will ride a wagon to the cemetery to meet some of the area’s colorful former residents. “The only spooky part of it is it will be at the cemetery at night,” Watson said. People should dress for the cold and bring flashlights. LED lanterns also will be available for purchase. The cost of the tour is $20 for adults and $15 for museum members and students. Children between ages 10 and 14 cost $10 when accompanied by an adult with the ticket. The tour should be finished by 8 p.m., and attendees will be able to meet the cast after the event at the Haven. A limited number of tickets will be available at the event, but Watson encouraged people to guarantee their spot by buying tickets before the event at http://www.haydenheritagecenter.org. Watson said the idea for the lantern tour came from a similar event in another community that a museum board member had attended. She said the museum was looking to host a unique event that would showcase the area’s history. Among the other characters being depicted will be Coke Roberds, a quarter horse breeder who was inducted into the American Quarter Horse Hall of Fame in 1986. “If you’re into horses, you know who he is,” Watson said. Watson said they hope to continue working with the high school to make the lantern tour an annual event.